The Bahi Hut is the spot. The intimate spot to meet all your friends, The Bahi Hut! With the island charm you love the most. On Sarasota’s famous North Trail you’ve got The intimate spot to meet. 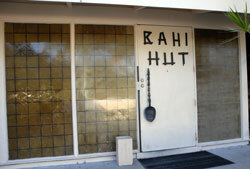 The Bahi Hut! I drove by on my way to the Mote Aquarium event this evening and just had to stop in. And what do you do at the Bahi Hut? 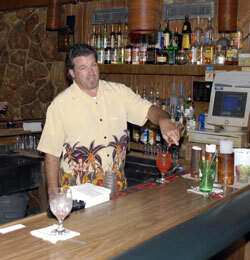 Drink Mai Tai’s. That’s not pronounced May Tay. So Kip here was tending and agreed to a picture as he made me one of their world famous (only 2 served to a customer) drinks. Nothing has changed and there are more pictures in the online photo album. I don’t think I’ve been in this place in 30 years. Looks exactly the same.